It's almost mid-January already (what?!) and I'm just now getting to my January goals - that's what having the plague for the first half of January does to a person! Since its a new year I'm starting off fresh and won't be recapping my monthly goals (mostly because December was a write off and I think I only accomplished one thing from my Dec goals...). I'm going to try my absolute hardest to make sure that I am working each month to accomplish my goals. There's just something about a new year that makes things seem more attainable. Let's hope I can stick with it! Get a massage Through my benefits for work I can get up to $500 in massages every year and every single year I maybe get two massages all year long. This year I'm going to make sure I use up that money by getting a massage every single month. I think it will definitely help with my stress levels! De-clutter and organize the spare bedroom It currently looks like Christmas threw up in there so I need to set aside a full day to organizing and de-cluttering this room. Read at least two books from my reading pile I love to read but for the longest time I just wasn't making it a priority. I started getting back into it in mid December and I have a bunch of books that I'm excited to start so I'm pretty sure this will get crossed off for sure. I have another train ride to Minnesota coming up so I can probably knock the two books off in just that trip but I'm aiming small for this month since for so long I didn't make the time to sit down and read. If I read more than two then that's just a bonus! Work on my photography I've had my DSLR for a year and a half now and I still don't know how to use it outside of auto mode. I want to read some tutorials and play around with it a bit so I can function outside of auto mode.I also want to take some new blog photos so I can test what I learn then! 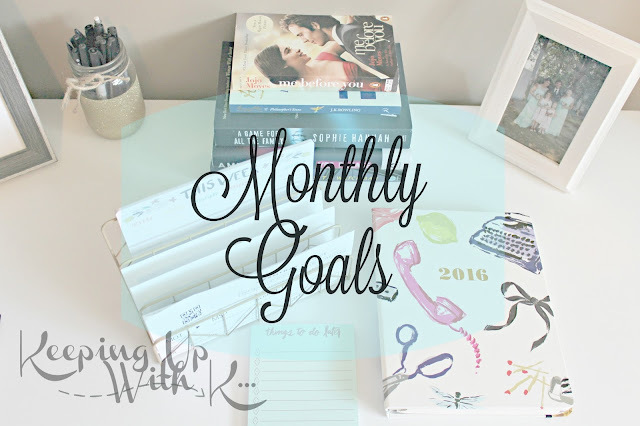 I have a post in the works about my 2017 Goals so I kept my January goals to just 5 things - look for my 2017 Goals post later this week! First of all, how are we already nearly halfway through January!? That seems impossible! Also, I totally get you with the plague thing, ugh. Blogging is just impossible for me when I'm under the weather and can't think straight. For the past two years I've been getting massages every 3-4 weeks and it's the best thing ever. Totally take advantage of your coverage! Can't wait to hear how you do with your January goals!